He obtained his bachelor degree in Chemical Engineering from National Fertilizer Corporation, Institute of Engineering and Technology, Multan in January 2013 and based on his performance was awarded silver medal by the institute. 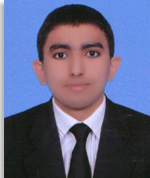 Then, he selected as a Chemical Engineer in Ghulam Ishaq Khan Institute of Engineering Sciences and Technology. Later, he appointed as lecturer in Institute of Chemical Engineering and Technology, University of the Punjab back in May 2015. In the same year he started his masters degree in Chemical Engineering from Institute of Chemical Engineering and Technology, University of the Punjab, Lahore. He is currently involved in undergraduate teaching and research activities regarding production of bio-fuels from empty fruit bunches.